On May 18, 1980, I was living in Sedro-Wolley, Washington. From Duke's Hill on the northern edge of town, I had a nice view of the valley below and points beyond. I remember the morning began with blue skies, sunshine and warming temperatures. At 8:32 AM I was on my deck in the backyard when I heard multiple explosions, boom-boom-boom-boom in rapid succession. The house and deck shook and I felt a shock wave in the air. Something in town must have blown up, and it was major. I wondered if it was the plant that manufactured logging equipment. 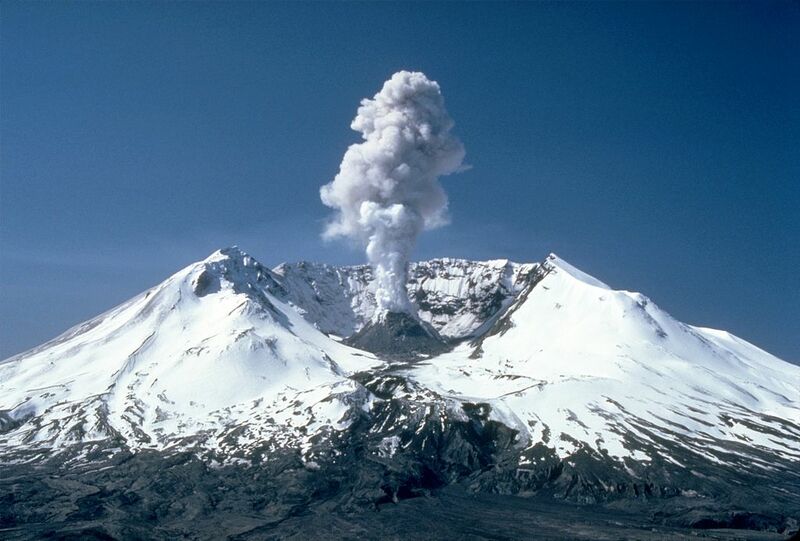 That spring, the leading local news story had been the apparent awakening of Mount St. Helens in southwest Washington. She was one of several dormant volcanoes spawned in the Cascadia Subduction Zone. We were getting nightly news reports about small ash plumes and earthquakes. We were learning the anatomy and physiology of volcanoes. The term "harmonic tremor" entered our vocabulary. These are long, low level vibrations associated with the movement of volcanic magma underground. Measurements had detected the formation of a bulge on the north slope of the mountain. Scientists and news reporters speculated on what all this meant and what would happen next. It is not uncommon for these mountains to rouse for a time, then settle back down to continue their sleep. It took a few hours for me to realized the explosions I had heard and felt were not from town. They were the eruption of Mount St. Helens 160 miles/258 km away. It had begun with the collapse of that bulge on the north flank which literally and suddenly uncorked the mountain. Instead of erupting upward from the summit, all the furies inside the mountain exploded laterally to the north. This might explain why I was able to hear it and feel it so distinctly. I could also see the ash plume, a big cloud on the southern horizon. What made the experience so amazing was how intimately it was felt, from something happening so far away. In subsequent weeks I would see two more ash plumes. My deck would also get dusted a couple of times by sparkling grit. Of course, this was nothing compared to what eastern Washington experienced. I still have a shoe box of pumice I collected near the Toutle River on a trip to Portland. Today, the mountain has been designated a National Monument. It has become a site for scientific research, exploration, education and tourism. Every year on May 18th, Mount St. Helens Day provides a moment to remember the events that occurred in 1980. What memories do you have of the eruption of Mount St. Helens? Thank you for sharing this... it was most enlightening and very well done. We lived in the PNW for awhile... surely it is paradise. Alas, I was in Boston at the time, having moved there the prior Sept after graduating from UW. Was so hard to miss all the excitement! My parents also felt and heard the blast from due south in east Multnomah County outside Portland. We had been able to see the summit of St. Helens from our kitchen window facing north, peeking above the ridgeline across the Columbia in southern WA, but after the eruption it was no longer visible.